There are a few ways that the Orthotic Shop will try to make your orthotics or arch supports fit right. If you purchased a pair of orthotics, they will ask you if anything needs to be modified on them. Modifications can include increasing the arch support, adding a different top cover for more cushioning or remaking the orthotic so that it is thinner and therefore less rigid. if you are not satisfied with how your orthotics or arch supports. If you purchased arch supports and are not getting the desired arch support, the Orthotic Shop will offer to exchange them to a different model. If neither of those options will work for you, the Orthotic Shop will accept the orthotics or arch supports back and refund your money for the cost of the product. The Orthotic Shop uses recognized Orthotic Labs that have been in the business of producing custom made orthotics for decades. The Orthotics are not produced in the back room of some office or in a basement, they are made by companies that are experienced in fabricating custom arch supports. The two primary labs that the Orthotic Shop uses is Amfit & Betterform. Amfit also know as Archcrafters has been producing custom orthotics since 1975. Betterform is a full-service orthotic lab providing the medical community with a complete range of custom and over-the-counter, prefabricated orthotics, diabetic/comfort shoes and foot care products for over 30 years. You can be assured that your foot molds are in competent hands when you order orthotics from the Orthotic Shop & they are made in the USA. Have a question about any of the products we sell? Email or call us and we will be happy to answer any questions you have. The Orthotic Shop has a robust email tracking system to ensure all questions are responded to in an efficient manner. Walking / Running Shoes: The Athletic Insoles with the foam topcover are great general purpose orthotic, great for walking, running shoes as they provide tailored support & additional cushioning. Sandals with arch supports. Arch support sandals are great for taking the support your feet crave to the beach. The sandals are also great for just lounging around the house. Ski boots, Snowboarders – narrow / thin orthotics – dress orthotics, Skiing & Snowboarding insoles are designed to fit into tight spaces. Insoles for over-pronation. If your feet or rolling inward, these Over-Pronation Insoles will help control the motion and get your feet back into the proper alignment. Golf shoe orthotics. Improve your golf came by getting your feet, knees, & hips back into the proper alignment with these golf insoles specifically designed for golf shoes. If you don’t want custom orthotics, the Premade or Lynco arch supports listed on the Orthotic Shop come in all varieties to give you the support you need. The Orthotic Shop carries only the best arch supports. These aren’t the ones you find at you local grocery store. These arch supports actually give you the support you deserve. Lynco Orthotics – are very popular and they make “arch supports” for all activities and shoes. Diabetics, Dress Shoes, Athletic Shoes, Golf Shoes, and even Ugg-like boots! Redithotics are a great all around insole – they have a heat moldable insole that you can alter via the toaster oven to increase or decrease arch support; a custom prefabricated arch support. Betterform’s premade arch supports – the top-notch orthotic lab used their expertise to create fabricated orthotics for all types of footwear. Most of the prefabricated Betterform shells are also heat-moldable. Betterform designed the prefabricated arch supports to fit 95% of the population. Dress orthotics. These dress insoles are thin orthotics designed to fit into tight footwear such as dress shoes. 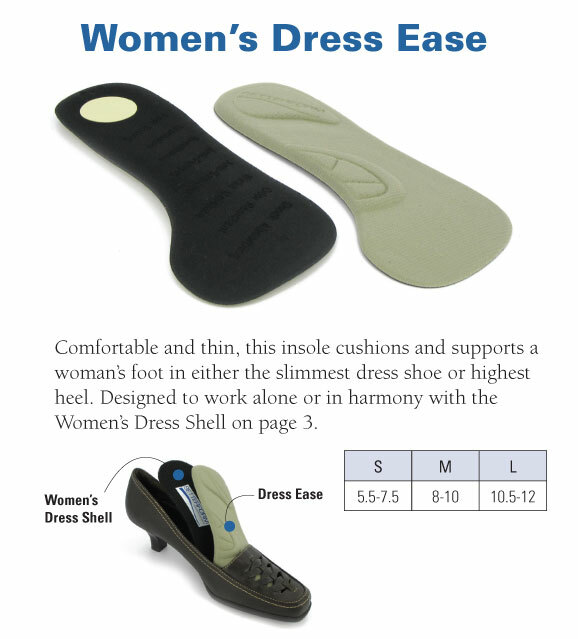 Women’s insoles that are designed for women’s pumps & heels. Betterstep HR – the HR (heel relief) features a gel plug in the heel and a 1/8″ EVA Shock Absorbing foam for additional cushioning. The HR is pictured below. Highly recommended Spenco Insoles & Sandals are a top choice by medical professionals in treating plantar fasciitis, supination and over-pronation. Finally, the fifth reason to purchase orthotics or arch supports from us is that we carry a wide selection of Comfort Shoes designed to accommodate custom orthotics & insoles. Additionally, The Orthotic Shop sells arch support sandals and flip flops with built in arch support. The Orthotic Shop is dedicated to providing your body a solid foundation and strives to be a one stop shop for all you all your foot care needs. The Arch Supports for Dress Shoes are ultra-thin, lightweight, and heat-moldable. The dress-ease cushion is great for providing extra cushioning in the highest heels or pumps and is the perfect companion for the arch supports. Select the ‘Buy Together’ option on the product page to get a 10% combo-discount. Be sure to update your sizes once you add them to your cart.